Intercity Transit’s contractor, Rognlin’s, Inc., began construction of the Underground Storage Tank (UST) Replacement project located at 526 Pattison Street, SE, Olympia on May 1, 2017. The project is anticipated to continue through May 2018. Construction activities will occur between 7:00 a.m. and 6:00 p.m., weekdays. There will be minimal traffic impacts. Neighborhoods can expect some incidental noise and dust related to operating heavy machinery. Intercity Transit is committed to protecting the environment and groundwater resources. The existing single-walled underground storage tanks are aging and past their useful life. Installation of new, double-walled larger fuel tanks will help to meet the current environmental standards and future fueling needs of Intercity Transit. This project is the first phase of planned improvements to support long-term maintenance and operations of Intercity Transit’s fleet. Contact Tammy Ferris, Procurement Coordinator, at 360.705.5818, or email at tferris@intercitytransit.com. Continue to check this page for updates on the Underground Storage Tank Replacement construction project. Installing the E-stops in the Maintenance Building. Today's construction activities consist of Lakeside Industries and Rognlin’s paving the temporary sidewalk along Pattison Street. Traffic control measures are in place, please be careful as you are traveling through the area today. In addition, other work activities for today include paving east of the new concrete parking area, and pulling forms from the light pole and lube room concrete pour from yesterday's work. Installation of the slotted drains in the bus parking area. Rognlin's continues work to install conduit and stormwater vaults on site; finishing up demolition on the concrete floor in the lube room; and preparing for the concrete pour on the next section of the bus parking area (currently scheduled for August 14th). The contractor is hauling off site extra excavated material and continues to get the east side parking area to proper elevation to prepare for the concrete paving formwork and installation. Electrical work continues in the Maintenance Building and demolition work in the Lube Room begins on Friday, July 7th. This week the contractor continues to work on the parking area and the stormwater structures. 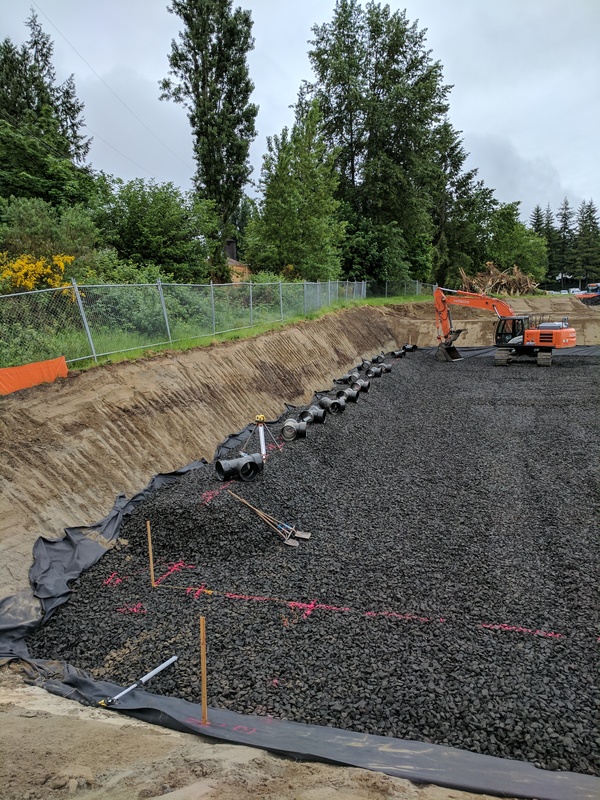 The week of July 3rd, the contractor will continue work on the stormwater structures, begin to form and set rebar for the concrete parking area, and install the electrical conduit in the parking area. The contractor continues to progress right along with UST project work. This week the contractor finished the underground stormwater retention system and completed backfilling up to the subgrade. 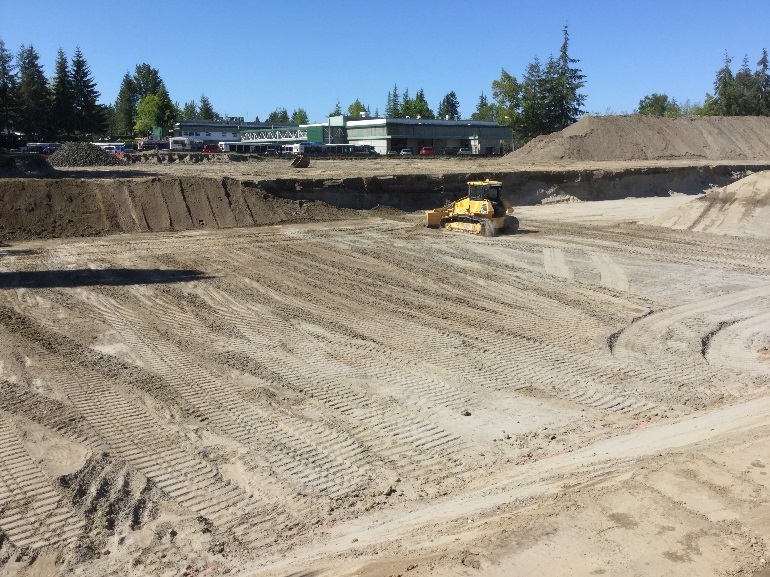 The contractor is continuing to install underground utilities next week and beginning to deliver and install the base material under the concrete parking area and will install the trench drains. The contractor’s electrician will start work the week of June 26th in the lube room to install conduit and conductors. UPDATE: Please be advised the contractor's work schedule has changed from the earlier update posted on June 7. June 8: 7:00 a.m. - 5:00 p.m. Adjacent businesses and residents can expect an increase in the amount of noise from the rocks hitting the plastic. Beginning June 8 - 12, between 7:00 a.m. and 5:00 p.m., the contractor will be placing rock over the plastic stormwater chambers of the newly installed infiltration gallery. No work will occur over the weekend. The contractor continues to build and install the stormwater collection, treatment and retention system located under the new parking area. This work will continue for the next couple weeks. CONSTRUCTION UPDATE: The contractor will not be hauling off site today. They will focus on cleaning up the construction entrances, silt fence work, and laying down additional quarry rock spalls at each of the construction entrances. The next couple of weeks the contractor’s schedule of work includes excavation and removal of material and grading the site. There will be a substantial amount of construction activity occurring onsite and a large number of dump trucks will be entering and exiting the construction site. As a reminder - drivers, pedestrians, and bicyclists, please exercise caution when traveling in this area.